WLAN routers for Internet access are also WLAN access points. In such cases, the access point has a DHCP and DNS server. So you configure your own IP network. Typically, WLAN routers for Internet access are also WLAN access points. In such cases, the access point has a DHCP and DNS server. So you configure your own IP network. But if you already have a DHCP and DNS server in the local network, the operation of an additional wireless router does not make much sense. Especially because the cascading of routers unnecessarily creates difficulties. This usually manifests itself with connection problems. 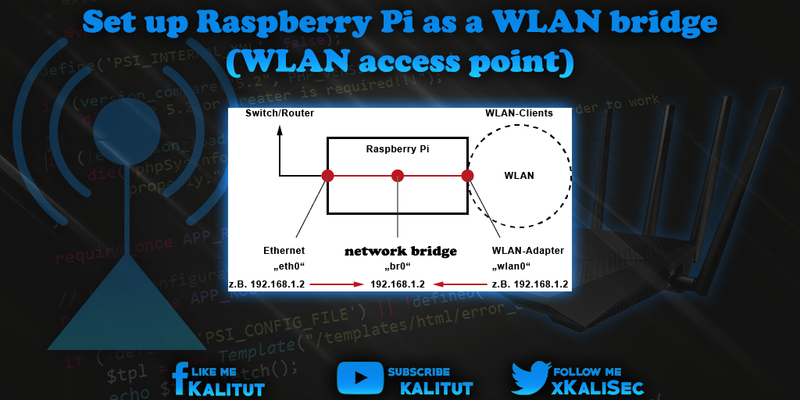 In general, it is sufficient to operate Raspberry Pi as a network bridge, which mediates the data packets and connections between WLAN and LAN. A network bridge, in English Bridge, connects two network segments. The connected computers are all in the same logical IP network and receive their IP configuration from the same address range. Of course, operating Raspberry Pi as a network bridge requires that the local network already has a DHCP server, a DNS server, and a default gateway. Check if the WLAN adapter has an access point mode. Set up the wireless adapter as a wireless LAN access point. Set up the Ethernet port as a transition to the wired network. To avoid setup problems, it is recommended to use a fresh Raspbian image. A Raspbian Jessie Lite is sufficient. In addition, you should make sure that the wireless adapter used with Raspberry Pi basically works and controls the access point mode. It works with the internal WLAN adapter in Raspberry Pi 3. First of all, let's see if the intended WLAN adapter is in AP mode. To check this, the wireless tools must be installed. If this command ejects one or more lines with "AP", then everything is in the green zone and the WLAN adapter dominates the access point mode. Then the WLAN adapter is suitable for our task. If not, then you should get another WLAN adapter. In Raspbian Jessie, a DHCP Client Daemon (DHCPCD) is enabled by default. The network configuration is done in the file " /etc/dhcpcd.conf ". For a part of the configuration of the network bridge we use the file "/ etc / network / interfaces" here. The DHCP Client Daemon is not affected. However, it is important to determine if the dhcpcd is active at all. Then we have to make sure that both the Ethernet interface (eth0) and the WLAN adapter (wlan0) are working and in place. Both network interfaces (eth0 and wlan0) must be present. The IP configuration is irrelevant. If Raspberry Pi and the Wi-Fi adapter meet all requirements, then we can get started. We start with the installation of the necessary software. Before that we do a system update. > Then we need two things: once an access point daemon and software for the network bridge. The Host Access Point Daemon (HostAPD), in short "hostapd", is a WLAN authenticator. He takes care of offering encrypted WLAN functions and the required authentication of the WLAN clients. For example via WPA2-PSK. "bridge-utils" contains libraries and commands to set up network bridges. After the installation, the configuration of the WLAN AP host and the network bridge is done. The file should not exist yet and be empty. If the file does exist, then you should completely override it. In the file we enter the following minimal configuration. Of course, there are even more parameters that are irrelevant in this case. Three settings have to be made individually. One is the WLAN name ("ssid"), the channel ("channel"), which can be freely configured from 1 to 13, but you do not have to change anything here. You may have to change the channel here, if a WLAN analysis shows that already several other WLANs occupy this channel. In principle, several WLANs can occupy the same channel. This is better than when the channels overlap. The third parameter is the WLAN password ("wpa_passphrase"). Here you should enter a password of at least 8 characters in clear text. If you already have a wireless access point, then it is not wrong to use its Wi-Fi name and Wi-Fi password. The clients then automatically select the WLAN for which there is better reception. To test whether the configured Wi-Fi bridge actually works, you should temporarily select a different WLAN name ("ssid"). Note on the WLAN driver: There is the parameter "driver" in this configuration file, which is commented out (#). Normally "hostapd" automatically loads the correct driver. Of course, that does not work. Then you have to explicitly specify the correct driver here. Then save and close with Ctrl + O, Return, Ctrl + X. Because this file contains the WLAN password in plain text, only the user "root" should have read access to this file. Do not worry, with the user "pi" you can change and save the file at any time. Now we have to configure the bridge and the network interfaces. For this purpose, we make the following minimal configuration in the configuration file for the network settings. It would also be conceivable to give the Ethernet interface a static IP configuration. This need not be. In this form, the WLAN bridge has the advantage that it works on any local network if the IPv4 configuration is delivered via DHCP. If IPv6 is enabled then it works as well. For a static IP configuration, it is also recommended to deactivate the DHCPCD. For all changes to be accepted, we recommend a restart now. After the restart, you should check whether the network bridge has gone into operation. Note: Do not be confused by the fact that only the interface "eth0, but" wlan0 "has not yet been added, the interface" wlan0 "will not be added to the network bridge until the interface goes live with" hostapd ". First we start the "hostapd" with the option "-dd" in debug mode. We will see "all" error messages. In debug mode (parameter -dd), "hostapd" will always produce messages, which need not be error messages. The debug mode is very informative in this case. If the configuration is correct and the WLAN adapter plays along, the configuration runs through. The program will not be finished. That is, "hostapd" does not return for command input. It can be ended with "Ctrl + C". If the "hostapd" crashes, then something is wrong. However, the errors are extremely diverse and the associated error messages are not always clear. A popular error is the missing "sudo" when calling the command. Other sources of error can be ruled out if you make sure that the wireless adapter works in principle and mastered the AP mode. Another source of error is the distribution used. It will definitely work with "Raspbian". Other stripped-down distributions can cause problems. You can also call "hostapd" normally. A good sign is when the message "wlan0: AP-ENABLED" appears. Then you can test the WLAN bridge. For this one tries with a WLAN client to find the WLAN and log in there. In the command line you can observe how the WLAN client logs in (CONNECTED) and also logs it out again (DISCONNECTED) when it ends the connection. Note: If you make the configuration via SSH, then you should do the testing of the WLAN bridge with another client, because otherwise you shoot the SSH connection by changing the wireless network. With the installation of "hostapd" it is automatically started in the background when booting. However, you still have to tell the daemon where to find its configuration. DAEMON_CONF = "/ etc / hostapd / hostapd.conf"
After a restart, "hostapd" will be started automatically with the created configuration. The WLAN bridge should then be available as a WLAN access point. If not, no output will appear here. So you should use a different wireless adapter. Another problem can be caused by the DHCPCD, because the interface breaks under the nail and thus can prevent the commissioning of the bridge. This line excludes the relevant interface from the network configuration. The operation of this WLAN bridge can fail in practice on one thing or another. As a rule, it is difficult to get to the bottom of the reasons. Basically, the WLAN interface is only added to the bridge when the "hostapd" goes into operation successfully. If so, then you can see if the bridge has also gone into operation. Here in the column "interfaces" both "eth0" and "wlan0" must be listed. Note: It may take a few seconds for the bridge to add all the interfaces. Therefore, do not panic immediately, if not yet both interfaces are displayed. If you are unsure at the point, then you should take a look at the system messages. If not, then you should look for error messages related to "wlan0" and "br0". One should know that there are USB sticks (regardless of the chipset), which are quite bitchy during initialization during the boot process. For example Fritz WLAN sticks of AVM. The initialize first a drive (for the driver installation). Only then does the stick go into WLAN operation. Corresponding instructions can be found with "dmesg". This of course has consequences for the automatic start of "hostapd". It can only go into operation if the WLAN interface is available. It may well be that you have to wait one to two minutes after the boot process on the wireless interface. If it exists, try to start the "hostapd" manually. If the service was started, then it is basically. If you change the hostapd configuration during operation, then you should make a restart of the "hostapd" afterwards. Alternatively, you can stop it and start again. No matter which solution, as a WLAN access point, Raspberry Pi is not so well suited for its interface performance. The facility is error prone, cumbersome and may not be safe. Apart from that, the Raspberry Pi with the necessary equipment is more expensive than a wireless router. If you seriously and permanently want to operate a wireless access point, you should take a look at OpenWRT and get a cheap compatible router to do so. Price, but also from the comfort is much more interesting. Anyone who sets up and starts up their own network components also takes responsibility for this. With this solution, you can possibly shoot yourself in the knee. If you think that the solution presented here is finished, then that is a mistake. If you do not take any additional security measures, then you break yourself with this network bridge a security gap in the local network. Please observe the safety instructions for operating a WLAN access point. This Wi-Fi bridge is great for recording network traffic. For example, for network monitoring or for man-in-the-middle attacks. A man-in-the-middle is a network device capable of listening, recording and manipulating network traffic. For this to succeed, the corresponding device must be in a network connection between two endpoints. That's exactly the case with the WLAN bridge.